Retargeting is growing as an area of marketing spending. With Google search and display being the dominant retargeting tools. Retargeting converts window-shoppers into buyers. Generally, 2% of shoppers convert on the first visit to an online store. Retargeting brings back the other 98%. Retargeting works by keeping track of people who visit your site and displaying your retargeting ads to them as they visit other sites online. 37% of surveyed online shoppers mentioned that they like to receive them if they can get better discounts. 21% reported that they like receiving them as a reminder about products that they are considering. 8% only said that they don’t mind them if they are on the same device that they used for the initial search. 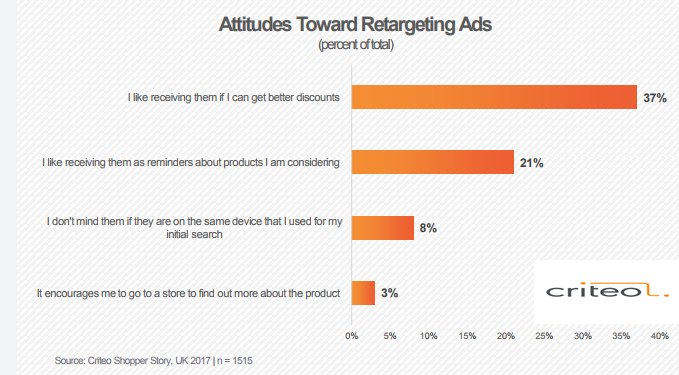 A Graph Shows The UK Online Shopper’s Attitudes Towards Re-targeting Ads, 2017.